Lovely to see pictures and hear stories of Harleen and Yuvi Grewal’s recent wedding in southern California, planned by Nikki and Madiha Khan of Exquisite Events. 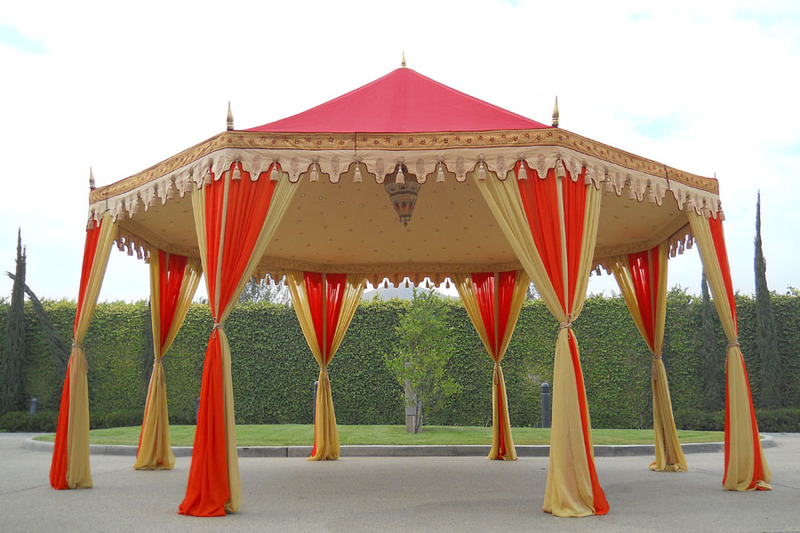 It is always a pleasure to work with Exquisite Events, with whom we have collaborated often to provide luxurious tented settings for the top Indian weddings in California. 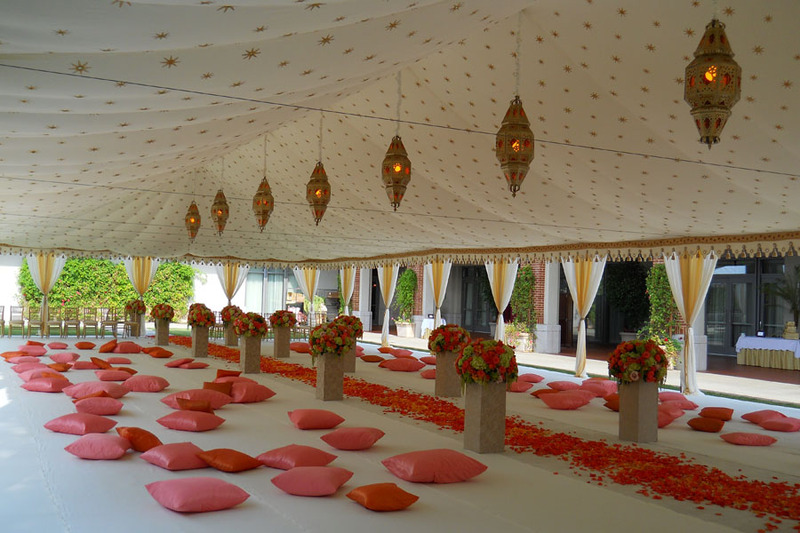 On this occasion, the ceremony took place at the Four Seasons Hotel in Westlake Village that has acres of lovely gardens, ideal for tenting. The interior of the tent was in cream with gold star print. 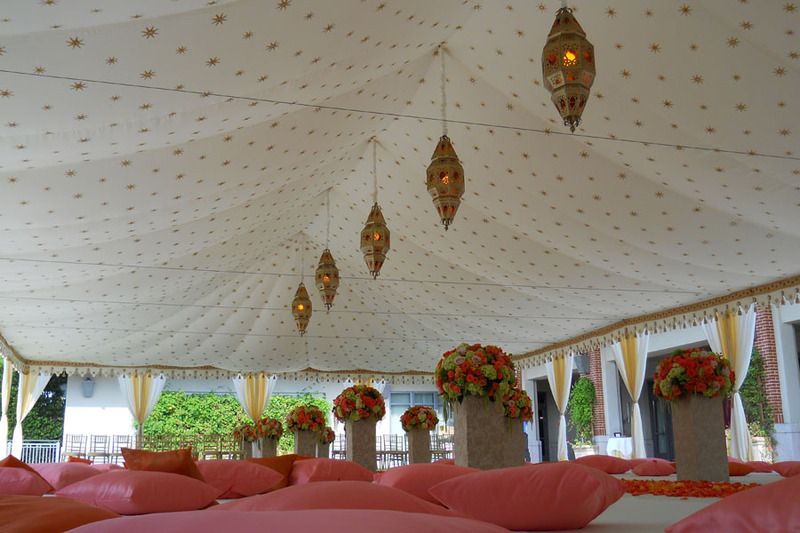 Ornate cream large rosette scalloping and matching cream and honey glow gold drapes decorated the outside edge, with large Ajmer hanging lamps across the length of the 40 foot x 100 foot tent. The flowers were delightful, which, along with pink and orange cushions brought in color and texture. One aspect that particularly made the wedding stand out was a two rose petal drops from a helicopter as the groom arrived during the Baraat. Over 600 guests attended the different events that comprised this very detail oriented, traditional, stylish and sophisticated Indian Wedding. 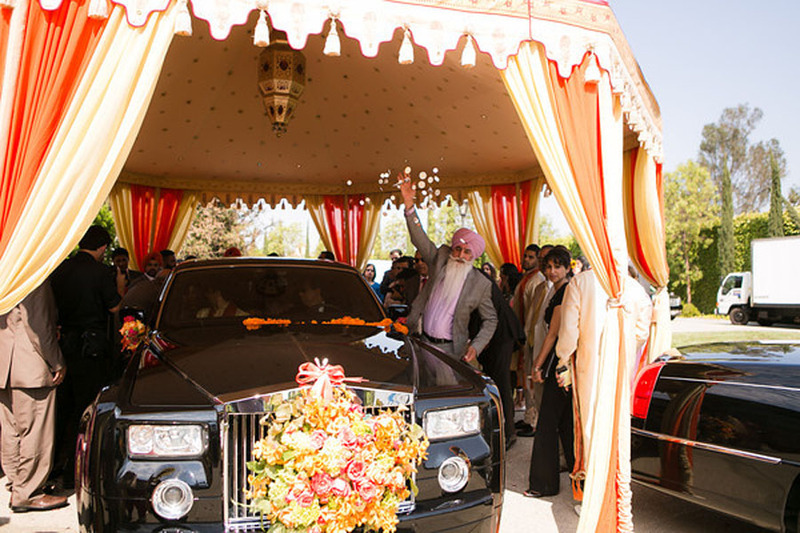 The Mehndi and Sangeet were held at the bride’s father’s impressive home in Porter Ranch, where hot pink and spicy orange Pergolas set the scene. All in all, it was a great success. Many congratulations to the beautiful bride and her groom!